The precise numbers (from Piketty and Saez) can always be argued with, but the basic trend is hard to deny. After the end of each recession, the well-off have pocketed an ever greater share of the income growth from the subsequent expansion. Unsurprisingly, there’s an especially big bump after 1975, but this is basically a secular trend that’s been showing a steady rise toward nosebleed territory for more than half a century. Welcome to the 21st century. Through mid-century, when times were good economically, most of the benefits trickled down to the bottom 90 percent of households. Then came the Reagan era and actual trickle-down economics. Suddenly, the benefits started sticking with the rich. Since 2001, the top 10 percent have enjoyed virtually all of the gains. This isn’t a totally new story. But it is a vivid and visceral illustration of what we’ve basically known to be true for a while (the graph is updated from this paper). 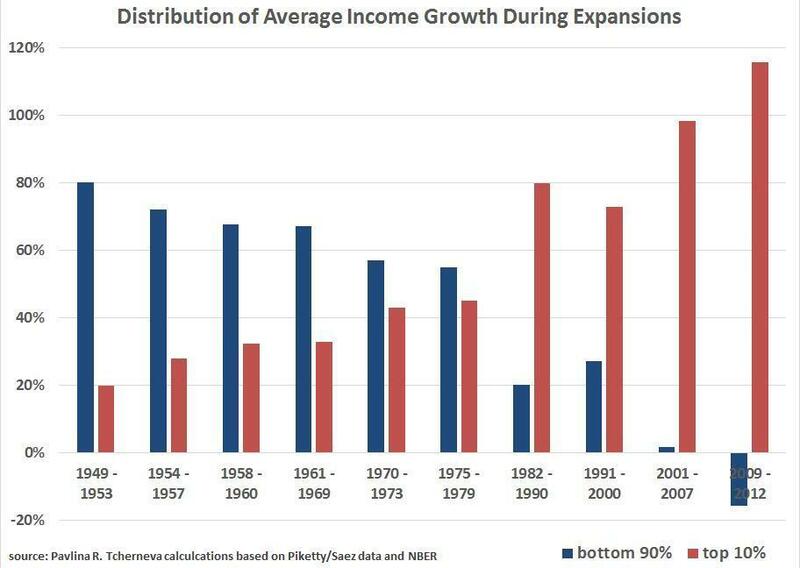 Most staggering of all, during our current economic expansion, the bottom 90 percent is suffering declining incomes. Not only is the rising tide not lifting everyone equally, it’s actually submerging nine out of ten people. So it seems that the theory behind trickle-down economics has been empirically refuted: its impact has been overwhelmingly trickle-up. It is also quite clear by now that huge tax cuts do not remotely pay for themselves – and the recent experience in Kansas only adds a final coda to this. And yet the GOP shows absolutely no sign of absorbing these facts, or having anything to say about the dangerous political instability of huge social and economic inequality and crippling debt that are their consequence. This is why I have such a hard time with contemporary American conservatism. It is still incapable of moving on from Reagan, even as the world has changed beyond recognition.